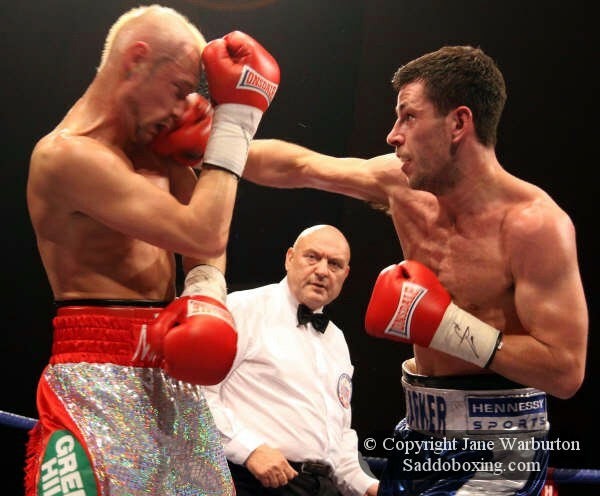 Last night at the Colosseum in Watford, England, Hennessy Sports promoted a fight night which would see Darren Barker's third defence of his Commonwealth Middleweight title, facing Darren McDermott. Darren McDermott, "The Dudley Body Snatcher", entered the ring to the sounds of ‘One Step Beyond’ by Madness and enjoyed huge support from the Dudley fans who had travelled to Watford. 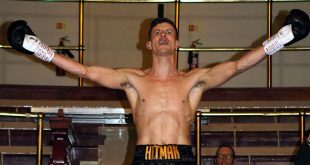 The Champion, "Dazzling" Darren Barker of Harrow, London, entered the ring wearing Chelsea colours while Chelsea football star Joe Cole looked on. The fight begins and it’s a close, but at times - messy - first round with both men being told to clean it up . Barker finds success with the right in round two and continues in the third frame with McDermott throwing uppercuts. But Barker is relentless with the left jab in Macca’s face and lands on target with the right. Inside the last forty seconds of round four, Barker lands a peach of a right which sends McDermott crashing to the canvas. He gets up from the count, but referee Dave Parris calls off the contest. 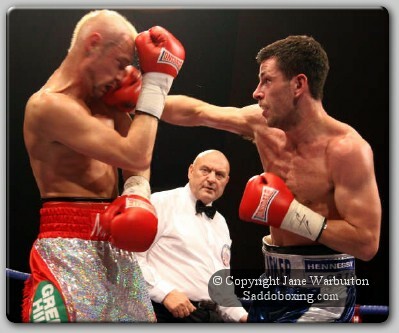 Darren Barker wins by stoppage in round four to retain his Commonwealth middleweight belt. Barker's record now stands at a perfect 20 wins (13 by KO). 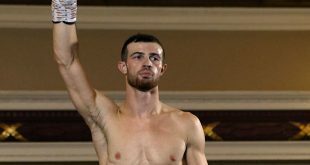 Afterward, promoter Mick Hennessy said that Barker was now British champion Matthew Macklin's mandatory challenger and that he hoped Team Macklin would take the fight. A disappointed Darren McDermott said that he had stayed down for the count as per his trainer Dean Powell’s instructions and that he stood up when Dean signalled to him. He insisted that he felt okay and was flabbergasted when referee Parris called it off. Also on the bill, heavyweight sensation Tyson Fury of Manchester faced Scott Belshaw from Lisburn, Northern Ireland, in a scheduled eight round contest. Straight away, Fury gets busy with his left jab - continually chipping away in front of Belshaw's face and it’s not long before he finds his target. Just into the second minute of the first round, Belshaw starts trying the big clubbing overhand rights. At the start of the third minute, Belshaw's face is already reddened from Fury’s jabs and his nose is starting to trickle blood. Fury starts to back up the jab, following up with the right and moments later, the Northern Ireland boxer is pressured against the ropes. He throws another wild right punch, but Fury lands a left to the body and - with delayed reaction - Belshaw drops to a knee within the last half minute of the first frame. Getting up from the count, Belshaw takes another left from Fury which sweeps across the front of Belshaws’ torso. Grimacing with pain - he falls to the canvas. The bell signals the end of the round and Belshaw goes back to his corner - saved by the bell! As the second round begins, Belshaw throws another big swinging right which misses - as does his clubbing left immediately after which sends him slightly off-balance. With less than a minute gone, Fury lands another left hook to the body and again Belshaw doubles-up with pain. Referee Richie Davies calls a stop to the contest. Fury wins by second round knockout, improving to 6 wins (6 by KO) with no losses, and made no hesitation in ‘calling out’ rival Derek Chisora after the fight. Another ‘Fury’ was fighting last night. This time in the form of ‘Intense’ Phil Fury from the same family of fighters. Making his pro-debut, young, and considerably smaller, Phil Fury of Lancaster faced late opponent Louis Byrne of Cambridge in a four round welterweight contest. It was a good, testing first outing for Fury, who scored a points win over the more experienced Byrne. 10 x 3 middleweight contest. Hillyard was retired by his corner. He failed to come out for the fifth round after having been knocked down at the end of the fourth. 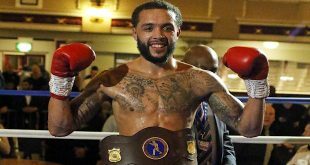 Thirlwall improves to 19 wins (10 by KO) 3 losses (1 by KO). O’Meara won on points, 60-54, over last minute opponent Drew Campbell and improves to 8 wins (2 by KO). Evans secured a draw with late opponent Kirillovs. Evans record now stands at 1 win and 1 draw while Kirillovs goes to 1 loss and 1 draw. 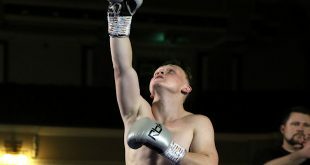 Having put his opponent down twice, Barnes wins by first round TKO to secure his second pro win.